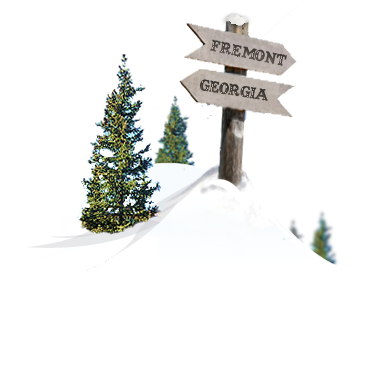 Our Georgia Pass Snowmobile Tours offer the closest basecamp to downtown Breckenridge, Colorado. 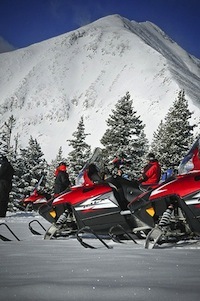 Our 3-Hour Breckenridge Snowmobiling Tours at Georgia Pass are ideal for individuals, groups, and families seeking to combine a spectacular trail ride with some of Colorado’s most impressive high alpine scenery. Ascending to an elevation of 11,585 feet atop the Continental Divide, Georgia Pass Tours provide riders with spectacular views of Breckenridge, Keystone and Copper Mountain as well as the Gore and Ten Mile mountain ranges. 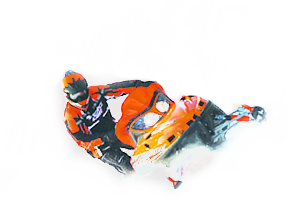 Your Snowmobile Tour begins with an overview of your machine followed by a brief practice session to become better acquainted with its handling. You’ll then ascend through the Swan River Valley’s alpine forests on well-groomed trails that lead to open bowls and meadows atop Georgia Pass. Upon reaching the timberline, enjoy wide-open cruising on the Continental Divide with stunning views of Colorado’s highest peaks and the Arapahoe National Forest below you. Here, guests have the opportunity to open up their snowmobiles’ throttles and play in some of Colorado’s bottomless champagne powder. Breckenridge Snowmobiling Tours at Georgia Pass are offered Tuesday through Sunday (closed Mondays) at 9:00 am. Georgia Pass is located just a short drive from the towns of Breckenridge, Keystone, Frisco, Silverthorne, Dillon and Copper Mountain, Colorado. Complimentary transportation is offered from the town of Breckenridge, only. Please let our reservations staff know if your party will require transportation when making your reservations, as this space is limited. Children ages 4 & 5 ride for free! 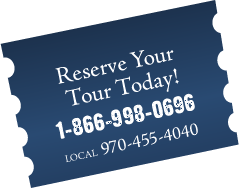 Book Your Colorado Snowmobile Tour Today! To book your 3-Hour Breckenridge Snowmobiling Tour at Georgia Pass contact us toll free at 1.866.998.0696 or locally at 970.455.4040. Snowmobile drivers must be 15 years of age with a valid learner’s permit. Drivers must be 18 years of age or older in order to carry a passenger on their snowmobile. Our Georgia Pass Snowmobile Tour is not recommended for children under the age of 4. Please note that Breckenridge Snowmobiling Tours have a 48-hour cancellation policy (72 hours for groups of 10 or more snowmobiles). Please bring a credit card with you, which will serve as your damage deposit. A signed liability waiver is required prior to guests' tour departure. If providing your own transportation, please arrive 1/2 hour prior to tour departure. Helmets, boots and snowmobile outerwear is provided at our Breckenridge Snowmobiling base camp free of charge. We request that guests bring their own goggles or sunglasses as well as a hat and warm gloves or mittens.